A fun summer spin on the Mediterranean favorite! 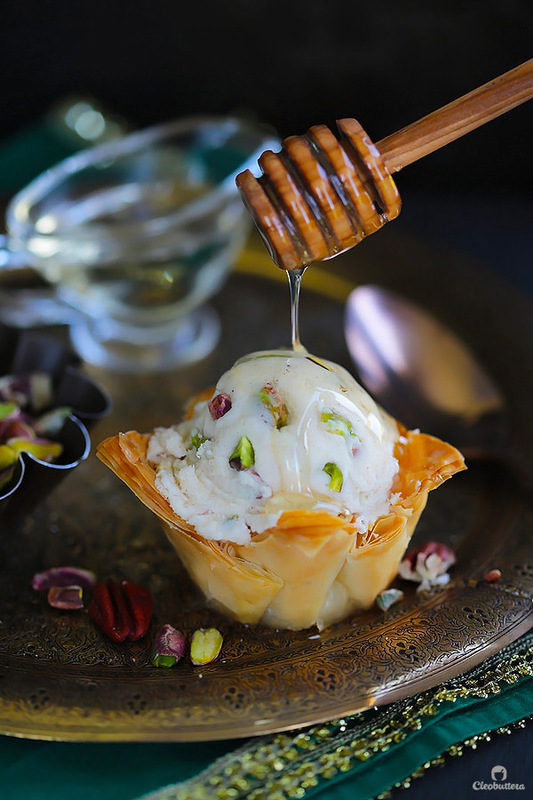 Crispy phyllo cup sweetened with cinnamon honey syrup, topped with a scoop of an easy to make candied nuts cinnamon ice cream that tastes just like the inside of a baklava. I know what you’re thinking? Two ice cream posts in 2 days?! 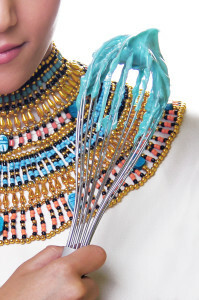 Well…when the weather in Cairo is eleventy thousand degrees, I’d make an outfit out of ice cream if I could. 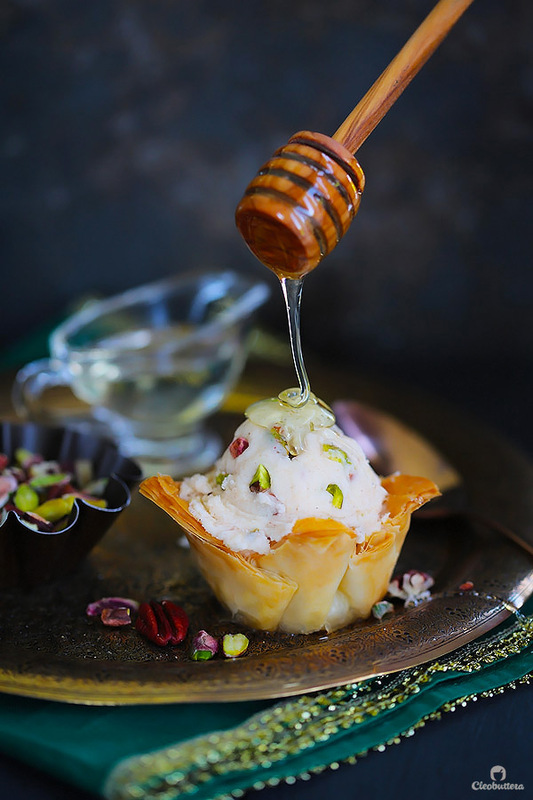 First we took a Middle Eastern staple, Konafa (kunafa, knafeh,…however you wanna spell), and turned it into an epic ice cream creation, THE CONE-AFA! We’re taking the much-loved Mediterranean delicacy, deconstructing it, giving it the royal treatment and turning it into one head-spinning sundae. And the results are supercalifragilisticexpialidocious! This is exactly what you’re getting here. 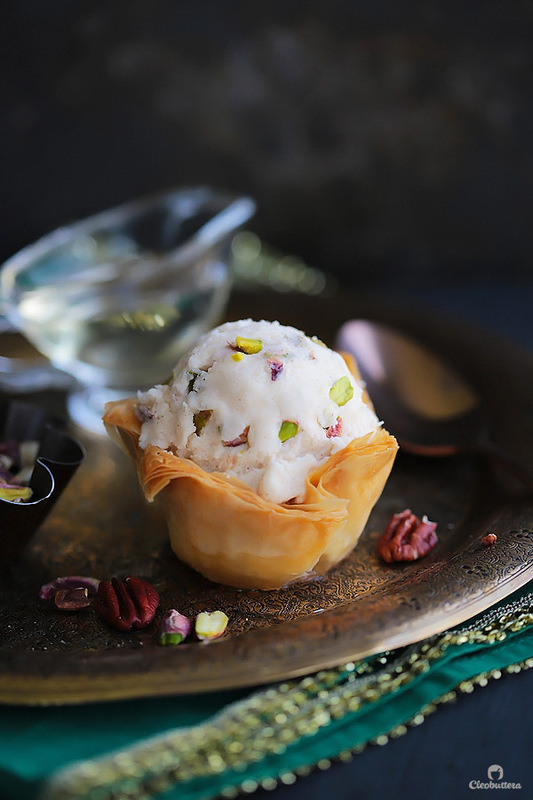 Best quality store-bought vanilla ice cream gets flavored with cinnamon and a generous handful of candied pistachios and pecans (or walnuts), creating a warmly spiced velvety ice cream, contrasted by the irresistible crunch of the nuts. I was this close to making cinnamon ice cream from scratch, but ditched the idea in favor of ease. 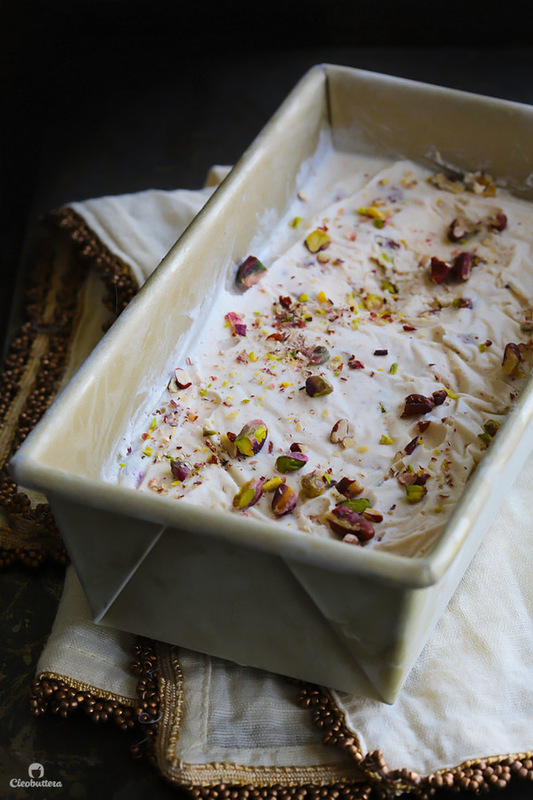 This is an easy, simple dessert after all and I wanted to keep it that way. 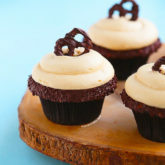 And trust me…every bite will excite you more than the other. 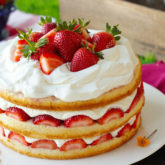 It’s yummy! 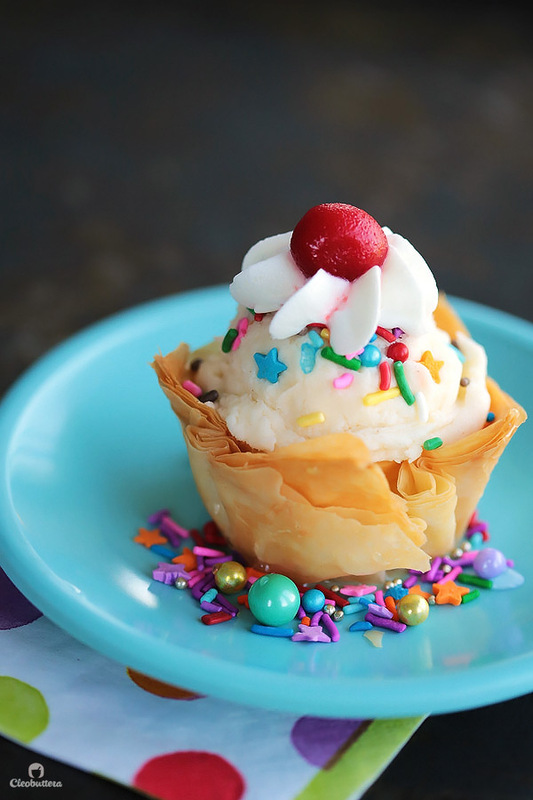 But what makes it even yummier, are the phyllo cups it sits on it. No baklava is complete without crispy, delicate layers of phyllo, and this one is no different. I’m telling you…this stuff is so addictive that I could just eat them plain. 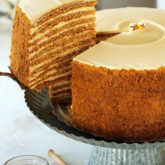 It’s sweetened and flavored with a cinnamon honey simple syrup that puts it over the top. 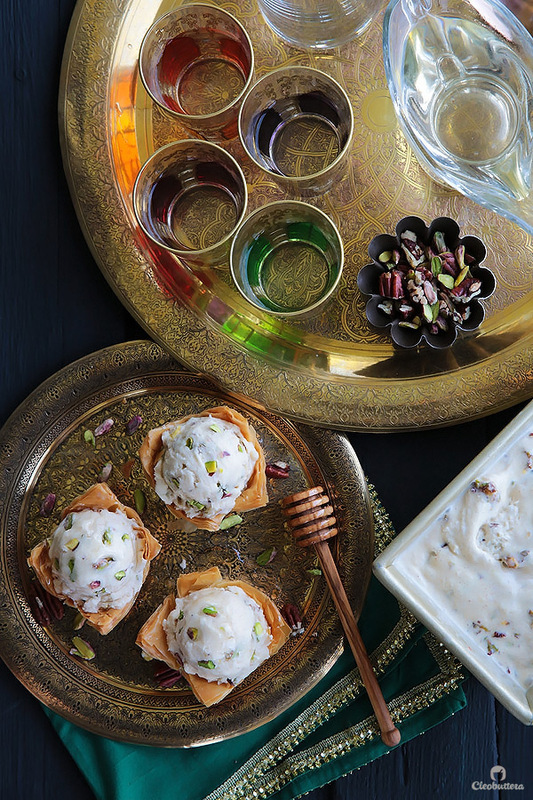 The baklava I’m used to in Egypt (known as baklawa) is more traditionally soaked with a honey-less, spice-less sugar syrup, which is still great. But I decided take the Mediterranean route here, and add honey and spices like they sometimes do in Greece and Turkey, for a more pronounced baklava flavor. And it does the trick oh so beautifully! These sundaes are the perfect, effortless summertime dessert, for when you’re having guests coming over. Everything could be made days in advance and just assembled right before serving. The baked baklava cups will stay crisp for about 3 days, if not more, which makes it super convenient. So let’s get started! 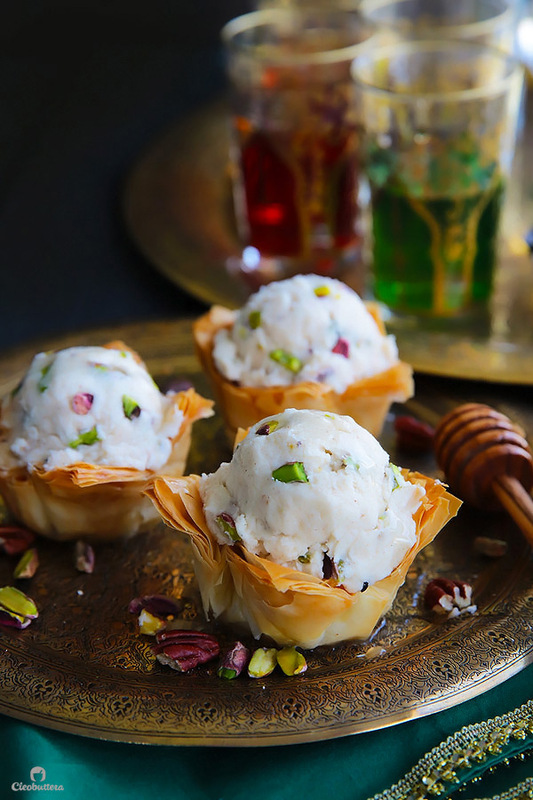 Let me show you how you could make these ice cream-ized baklavas! You first want to start with the ice cream, because it needs to be refrozen until it comes back to its solid state. I recommend making it the day before. Or earlier if you want. We’ll start by making the caramelized nuts that goes into the ice cream. 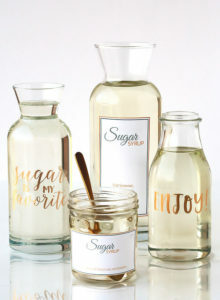 To make that, you’ll cook some sugar with a little bit of water until it turns amber in color. You’re then gonna stir in the nuts. I used pistachios and pecans. Then turn that onto a silicon mat and allow to cool completely. Once cool, chop up and fold into slightly softened vanilla ice cream, along with some ground cinnamon. 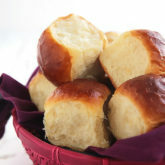 Transfer to a loaf pan or airtight container and refreeze until solid once again. 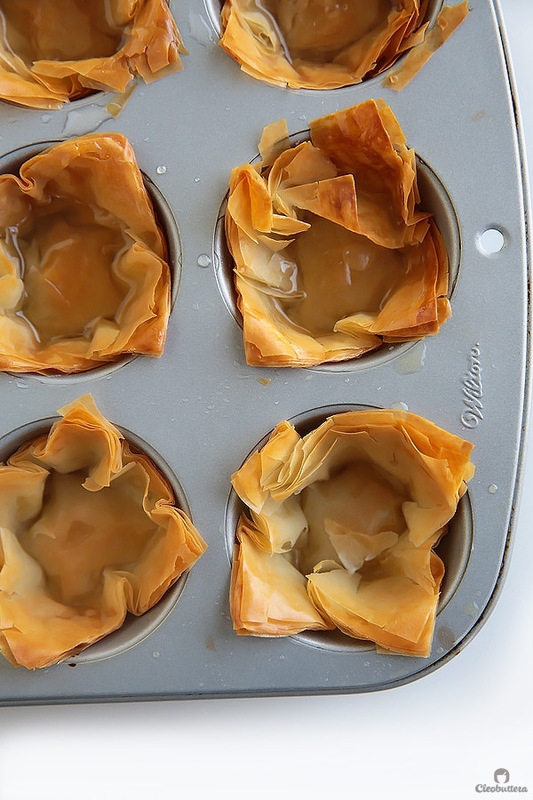 To make the baklava cups, you’re gonna brush melted butter between 6 layers of phyllo dough. Cut ’em up into 12 squares (or 9 rectangles if you prefer them bigger). 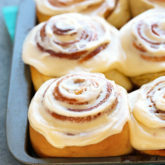 Fit them into a buttered muffin pan and bake! 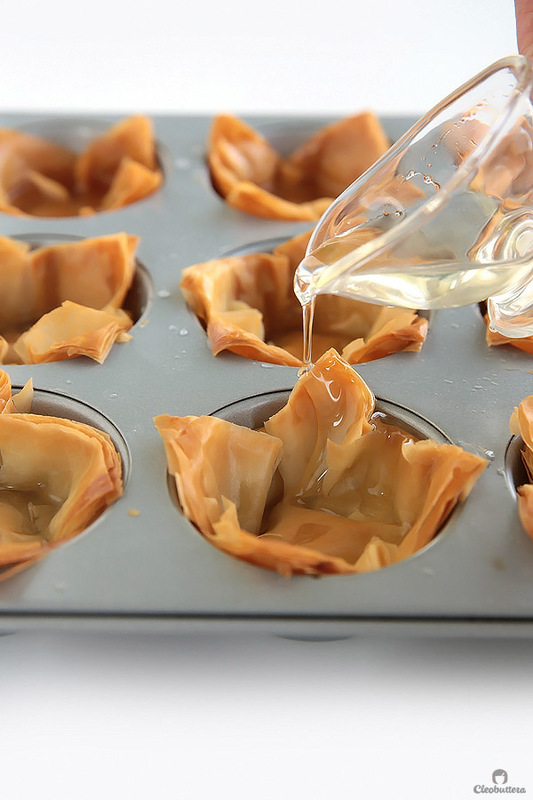 Bake until the phyllo cups are crisp and deep golden in color; about 12 minutes. Then immediately pour the cooled honey cinnamon syrup on top of each hot phyllo cup. Let the syrup soak in a bit. Then gently flip each cup upside down over the muffin pan and allow any excess syrup to drip. 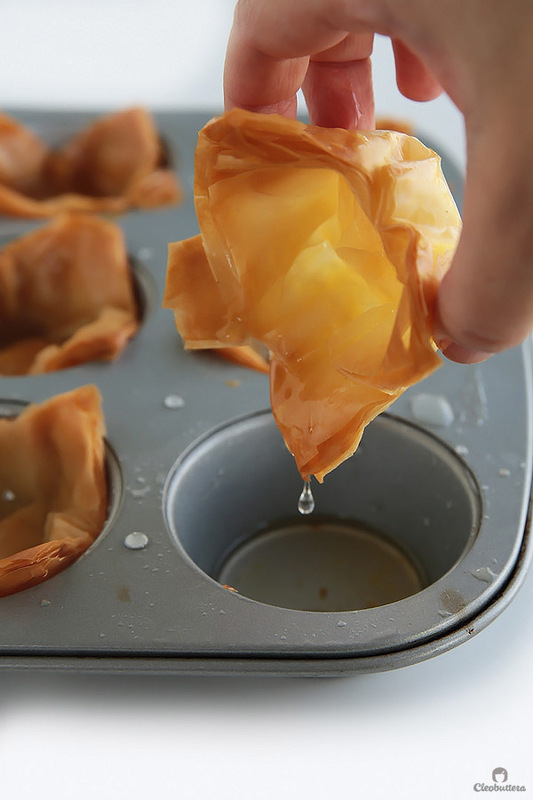 Transfer the phyllo cups to a wire rack that’s been placed on top of a sheet a foil or baking sheet and let them cool completely, allowing any excess syrup to drip off. 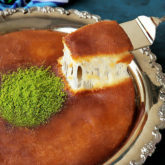 And now you deserve yourself some frozen baklavaaaaaaaa…. 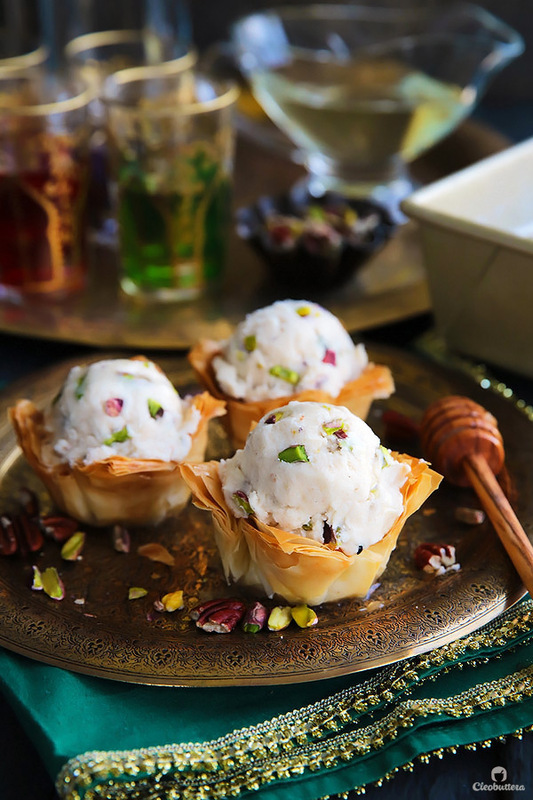 It’s cool, it’s creamy, it’s crunchy, it’s sweet and it’s everything you want in a baklava on a hot summer day. But let’s not forgot about the kids (or kid in you) who hate nuts. Vanilla ice cream, sprinkles, whipped cream and a cherry on the top is never a bad idea. 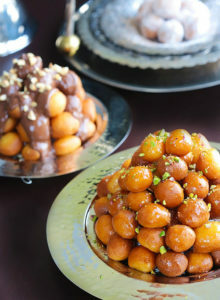 P.S: If you love baklava (and Nutella) be sure to check this one out! A fun summer spin on the Mediterranean favorite! Crispy phyllo cup sweetened with cinnamon honey syrup, topped with a scoop of an easy to make candied nuts cinnamon ice cream. 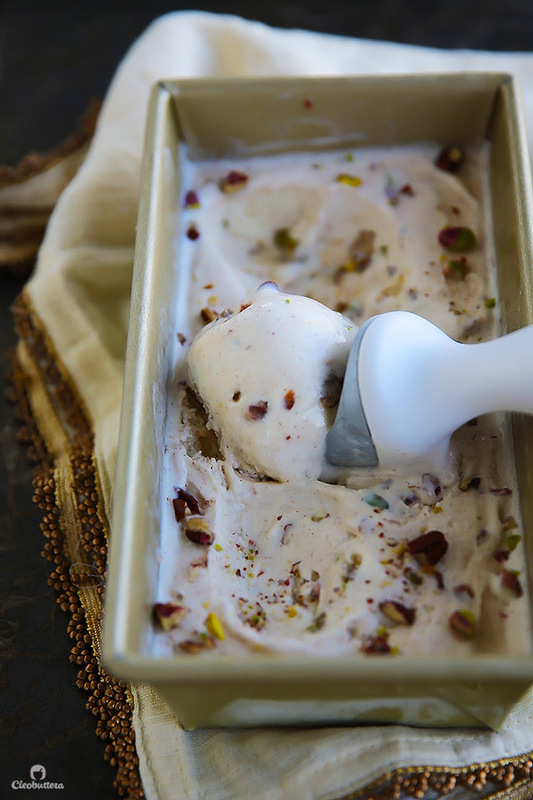 For the Baklava Filling Ice Cream: (may be substituted with you favorite flavor) *see note below Prepare a day ahead. 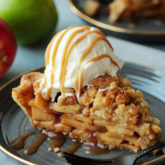 In a medium light-colored skillet, combine together the sugar and water. 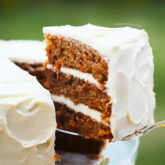 Bring them to a simmer over medium-high, swirling the pan to dissolve the sugar (avoid whisking). 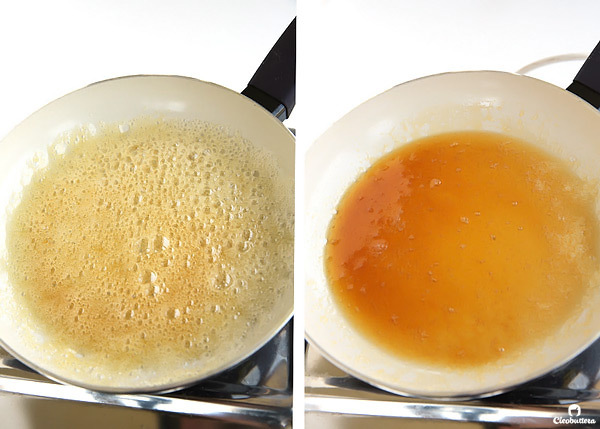 Allow the mixture to boil without whisking, just swirling the skillet occasionally, until it reaches an amber color. 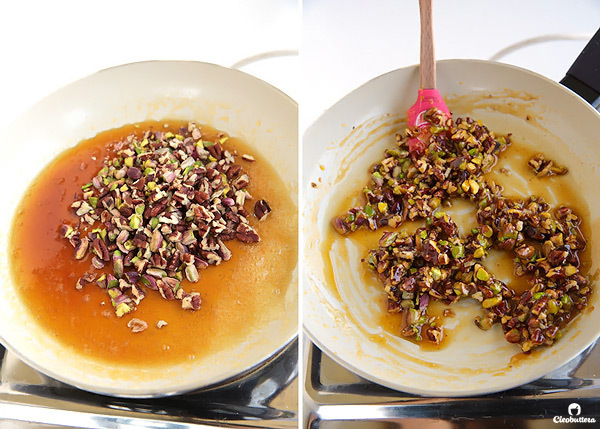 Remove the saucepan from the heat and immediately add in the pistachio and pecans (or walnuts). Using a rubber spatula, stir them together to evenly coat the nuts. Transfer the candies nuts to a silicon mat or parchment paper and spread into an even layer. Allow to cool completely. Once cooled, break up the candied nuts with your hands into little chunks or coarsely chop with a knife. Meanwhile, take the vanilla ice cream out of the freezer and allow it to soften slightly to a stir-able consistency. Do not let it melt. Transfer the ice cream to a large bowl. Add in the chopped candied nuts and cinnamon. Using a large spoon, stir together until well combined. 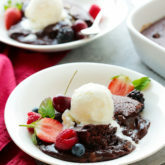 Transfer the ice cream mixture into a loaf pan or air-tight container. Cover with plastic wrap directly on top of the surface, then freeze until firm, at least 6 hours; better overnight. 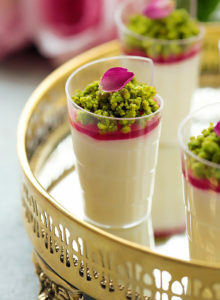 Meanwhile, prepare the phyllo Cups! 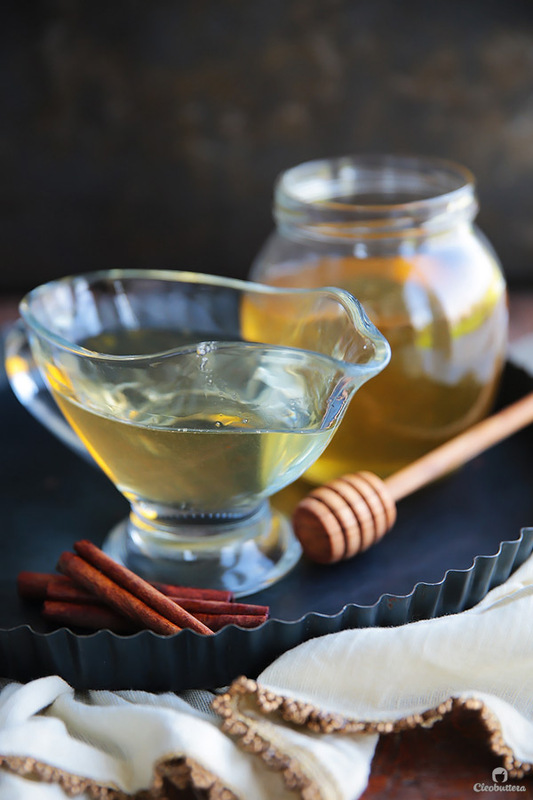 In a medium saucepan, combine the sugar, water, honey, lemon juice, cinnamon sticks and salt. Bring to a full boil over high heat, stirring occasionally to ensure that the sugar dissolves. Once boiled, stop stirring and turn down the heat to low. Simmer for 5 minutes until slightly thickened; SET A TIMER! Transfer to a glass measuring cup and set aside to cool while making and the phyllo cups; when syrup is cool, discard the cinnamon stick. Adjust oven rack of middle position and preheat the oven to 375°F/190°C. 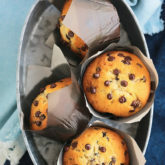 Brush a 12-cup muffin pan with softened butter and set aside. 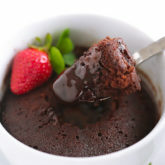 In a very small bowl, heat the 3 tablespoons of butter in the microwave until melted. Set aside for a while and allow the white milk solids of the melted butter to settle in the bottom of the bowl. You're just going to use the yellow fat floating on top. 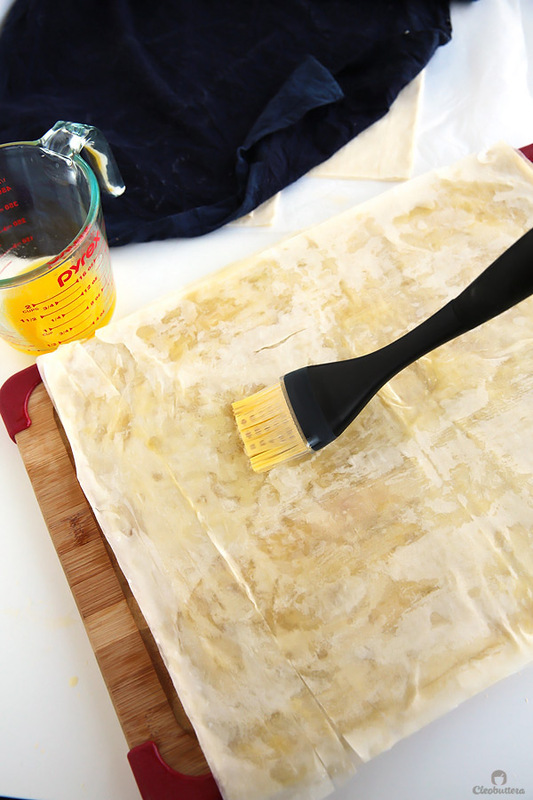 Place 1 phyllo sheet on a work surface and cover the remaining sheets with a clean damp towel to prevent from drying. Very lightly brush the phyllo sheet evenly with a little of the yellow part of the melted butter. Top the buttered phyllo sheet with 1 more sheet and brush with the butter in the same manner. Continue with the process of layering and brushing with the remaining 3 phyllo sheets. Top with the sixth sheet, but do not butter that one. 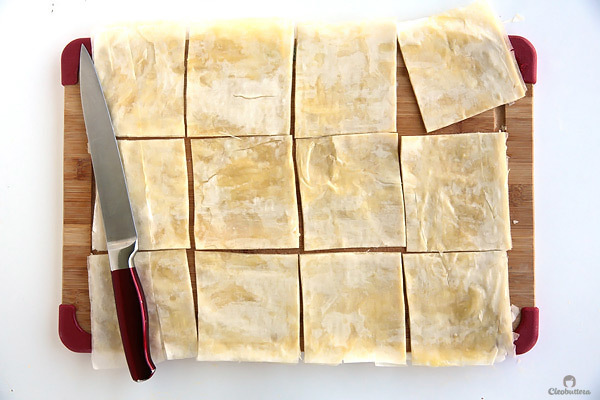 Using a sharp knife, cut the phyllo stack into 12 equal squares or 9 rectangles if you want them bigger. Carefully fit a square (or rectangle) of phyllo into each buttered muffin cup, creating a ruffled phyllo cup. 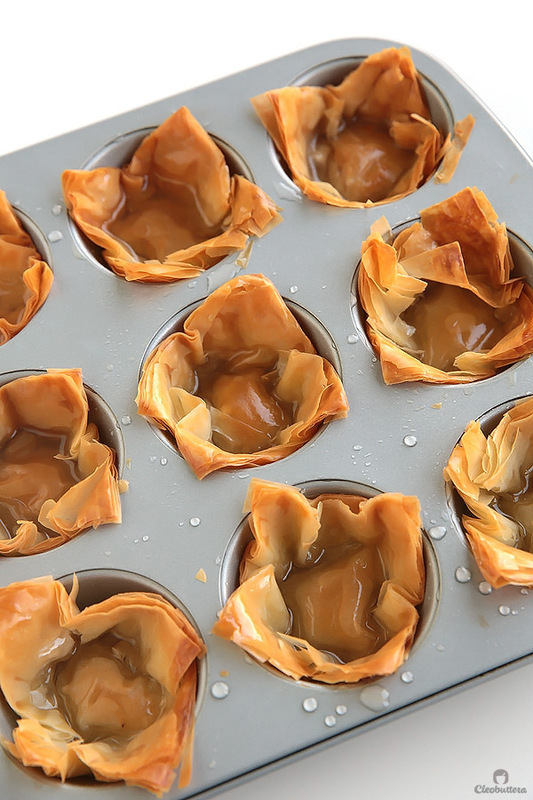 Bake until the phyllo cups are crisp and deep golden in color; about 12 minutes. Immediately pour the cooled cinnamon honey syrup on top of each hot phyllo cup. Allow the cups to soak the syrup and cool until slightly warm. 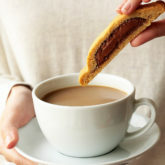 Gently hold each cup upside down over the muffin pan and allow any excess syrup to drip. 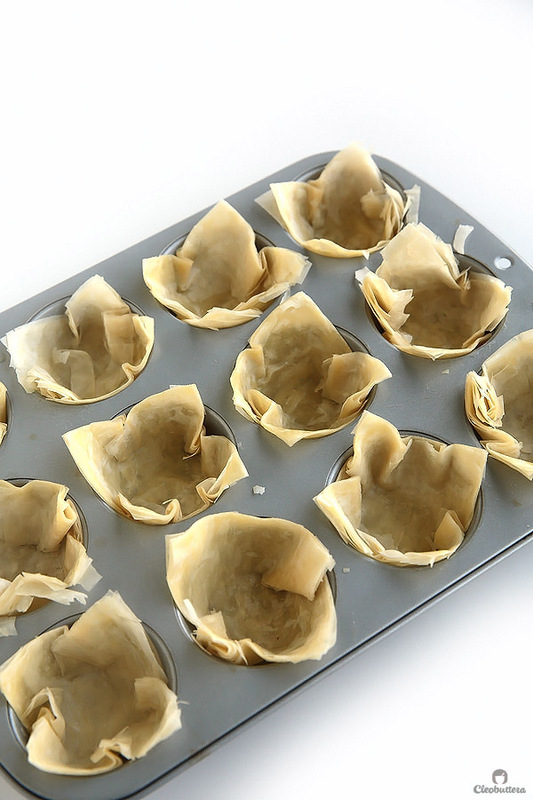 Transfer the phyllo cups to a wire rack that's been placed on top of a sheet a foil or baking sheet. 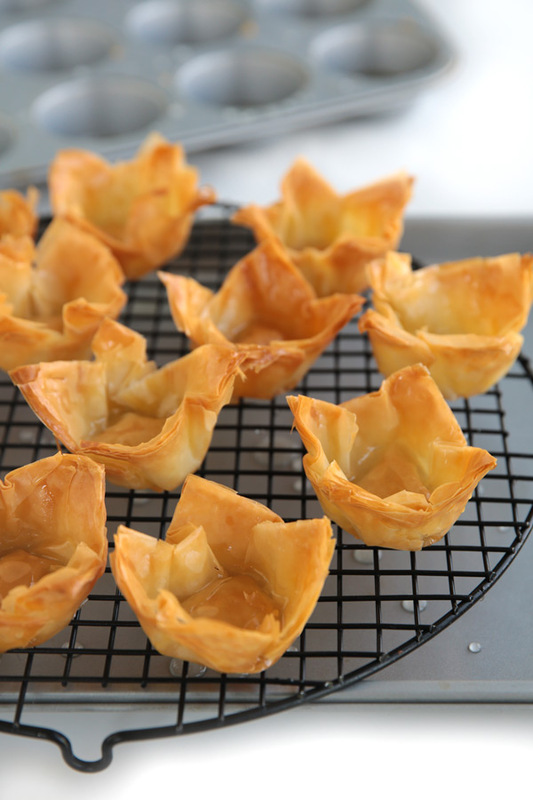 Let the phyllo cups cool completely over the wire rack, allowing any excess syrup to drip off. 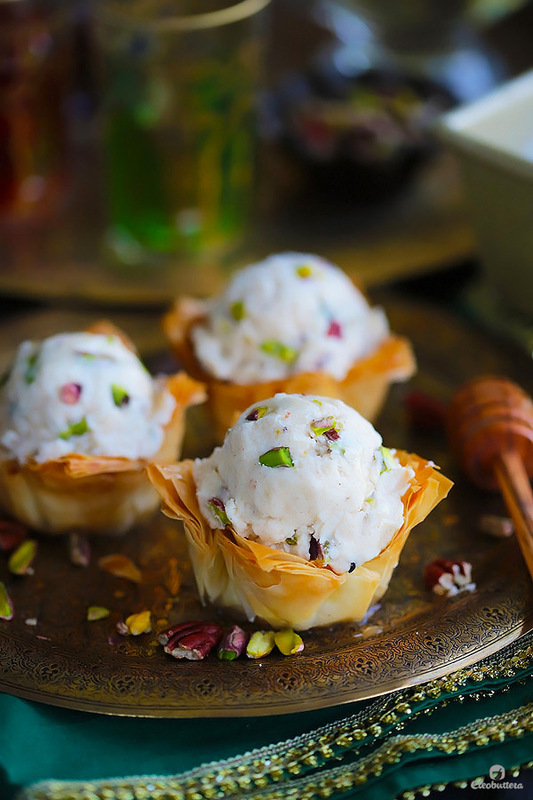 Scoop the Baklava Filling ice cream into the cooled cups, drizzle with extra syrup (if desired, although unnecessary) and extra nuts. Serve right away. For other serving variations, including a kid-friendly one, please refer to the 'NOTES' below. Feel feel to use your favorite ice cream flavor here. 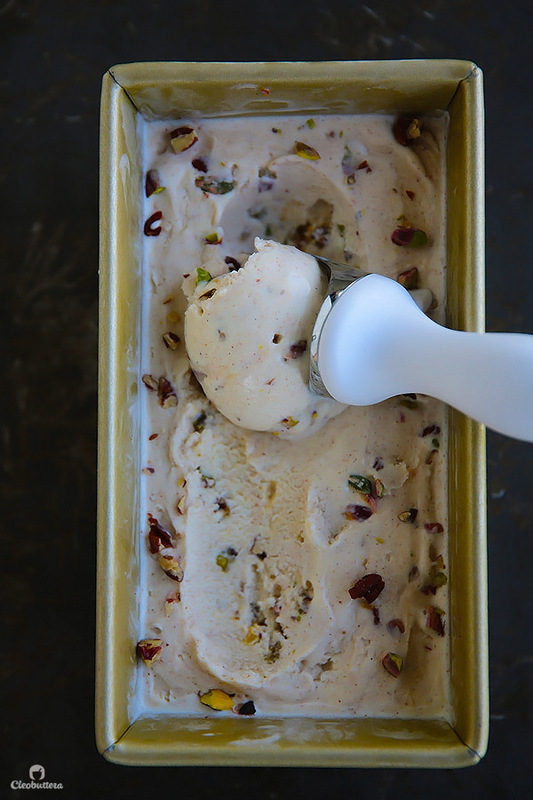 Cinnamon, honey, praline, butter pecan, pistachio, mastic will all go perfectly here. If using cinnamon ice cream, omit the cinnamon in the recipe. 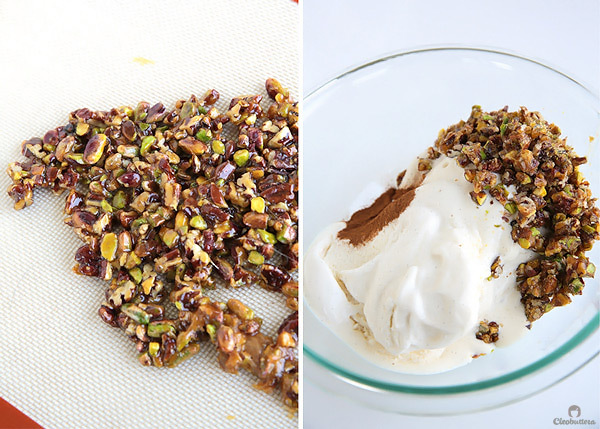 If using an ice cream with nuts, omit the candied nuts. 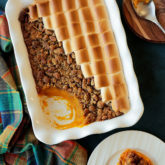 For a kid-friendly version, use plain vanilla ice cream and top it off with whipped cream, sprinkles and a cherry on the top instead of the candied nuts. If you're running short in time, you could skip the process of folding the cinnamon and candied nuts into the vanilla ice cream and let it refreeze. 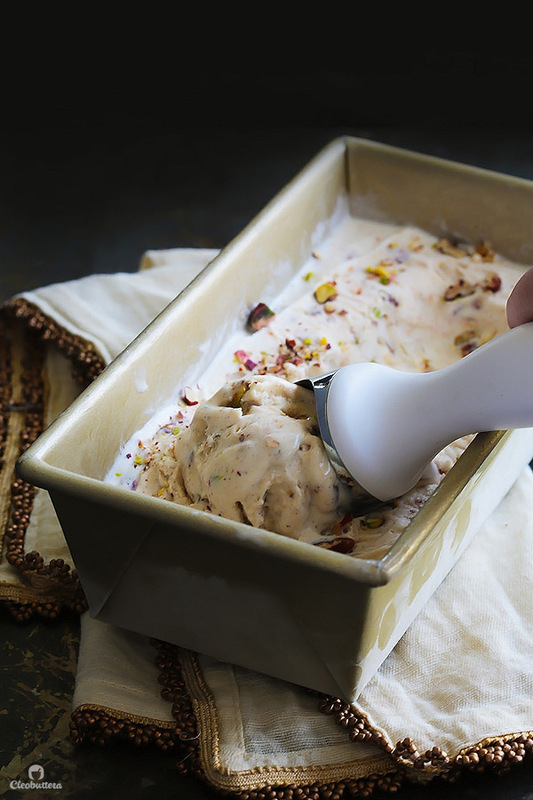 Instead, during serving, just dust the ice cream with a little ground cinnamon and sprinkle with the candied nuts. 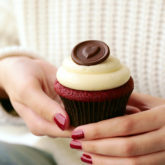 It will give you very similar effects without having to wait for the ice cream to refreeze. 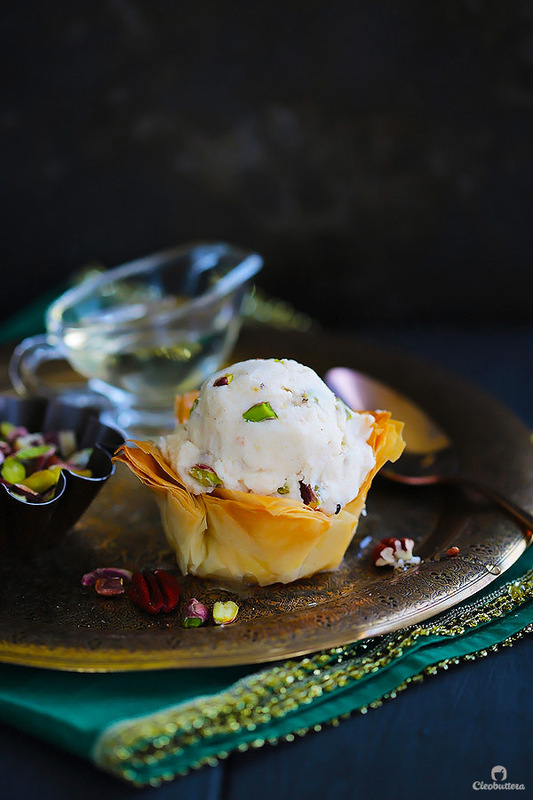 The baked, soaked baklava cups will stay crisp for about 3 days, if not more. So you could prepare them several days in advance, covered loosely with a sheet of foil. This and the cone-afa will make a turning point in history. And I’m speechless and humbled by your praise. Thank you so much. 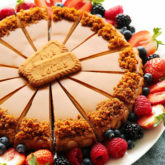 You need to write a cookbook….seriously…please!! Absolutely loved this idea and can’t wait to make it. I know my husband is going to be a very happy man when I served it to him!